This reference guide contains a complete listing of all the most commonly searched quests in Rappelz. The information is given as: Minimum level: Area found (NPC name) Quest title organized into neat sets. They are further colour coordinated to represent the area they are found in to give you an idea of where to find the NPCs. You can easily search the guide using your browsers' ctrl+F function, all names are true to the Rappelz-US release of the game. Note: most grinding quests and those from the quest brokers will not be included in these lists due to their simplicity and often dated rewards. This thread is not a detailed walk-through it does not list what mobs need to be killed etc, in most cases quests will contain all relevant information in their text windows. I have tried to include links to walk-throughs, these can be found as [Author] and are either English or German, I will not be sourcing any other language guides as I cannot verify their accuracy. If you have deleted a quest item crucial to the completion of further quests you will have to start a ticket with Customer Support to have it replaced. For Master Class, you must complete the quests in this order!! You must also be Job lvl 40 in your second class before you can advance. These lists were compiled from information shared by other players and personal notes from leveling my own characters. 2015-03-06: Removal of links to archived forum and Peir's site as it has been taken down. Quests here are relatively fluid but it is suggested to complete all quests before entering the pirate ship Navislamia which functions as an introduction to the main quest line in Rappelz. Lvl 10: Coast of Burning Sands (Trainee OB Tristan) Attack of the Worm Piranhas! The ship utilizes one-way portals, you cannot backtrack within the dungeon. The warp crystal gained at the beginning of this quest line is required to enter the ship – do not destroy it. This instanced dungeon opens at lvl 30 and becomes more difficult as you reach higher levels. You can collect/return these quest to the Union Member in any city. An additional (and unique) attribute of the vulcanus daily quests is that they give exp twice: the amount defined in the quest description + a bonus that increases with your level. Daily quest versions are available to Lvl 149 and under. Rewards include SS, Amplifiers and Devas Blessings. This quest line is not available for higher levels due to the final reward. Lvl 50: Rondo (Boss Ross) You’re Fired! Second part of the main quest line story. Third part of the main quest line, some quest mobs are quite difficult. No higher level assistance for the final quest. Quests intended to assist in leveling, cannot be started at lvl 150+, not expected to be completed solo. 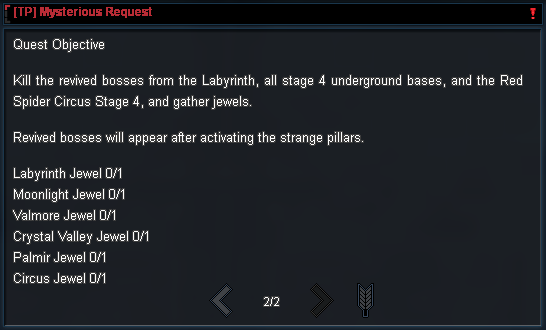 Second group of quests intended to assist in leveling. Mobs on the island have a difficulty level above champion mobs and below dungeon mobs. Not expected to be completed solo. Lvl 130: Veiled Island (Hunter Troph) Too Cold! Unique quest line with a final reward of a tamed Ice Maiden. These quests include the killing of several mobs and dungeon bosses that require 1 hour to respawn. Not expected to be completed solo. Lvl 130: Veiled Island (Friendly Mardukan Nakibu) Fetch, Boy! Lvl 130: Veiled Island (Friendly Mardukan Nakibu) Kill Draka! If you need to re-take a quest that doesnt come from an NPC click the abomination feather in your inventory. Fourth part of the main quest line also referred to as Vault/Laboratory quests. These quests include the killing of several mobs and bosses that require 1 hour to respawn. Many of the quests require completion via the quest window rather than returning to NPC. Not expected to be completed solo. Lvl 138: Ancient Magic Lab (Ancient Priest Recna) Ambush! Lvl 138: Ancient Magic Lab (Ancient Priest Recna) Hearing Voices Again? Lvl 138: Witchcraft Study () Hoodwinked! you need to do them in order: Red Farm -> Witch Hunting part 1 -> Witch Hunting part 2 -> MC trails. Final part of the main quest line, key to obtain MC and Talent Points. The trial platforms utilize one-way portals, you cannot backtrack between platforms. Some quests require you to obtain last hit on the mob while others are timed. Includes at least 1 puzzle per platform, you are not required to complete all quests to advance once enough points are obtained. Failure to gain enough points while completing all quests on a platform will result in you having to start the "Essence" quest again. Lvl 148: Chamber of the Warrior (Trial Assistant) Defeat Abhuva! Lvl 148: Chamber of the Magician (Trial Assistant) Defeat Betrayal! Lvl 148: Chamber of the Magician (Trial Assistant) Zombies! Lvl 148: Chamber of the Hunter (Trial Assistant) Silex! Lvl 148: Chamber of the Hunter (Trial Assistant) Leos! Lvl 148: Chamber of the Hunter (Trial Assistant) Octopi! Lvl 148: Chamber of the Hunter (Trial Assistant) Makrul! These quests can be taken in any order, Exploration and Steel can be time consuming but require nothing but patience and some gold. The stones needed for Exploration take several minutes to respawn, you may find it easier to collect them in groups of 5 or follow a trail rather than wait around. Note King of Creatures has a 'rage' debuff that is applied after each step in the quest and needs to be removed/time out before you can summon the next mob. after it was corrected they could reset their skills and be awarded an extra talent point. This has since be fixed, the max number of talent points you can receive is 7. This quest line includes the ability to summon a set of bosses into the final room of the cube dungeon, commonly used to increase the amount of exp gained per round, hence the decisions to do "spawns" or not. To board the boat that takes you there, you must have a Shepard Boarding Pass – This ticket can be obtained via the daily quest or bought for 50,000,000 from the Black Marketer NPCs. Most of the unlinked daily quests reward you with a coin that can be traded at any Coin Exchange Epic NPC for a variety of items including exclusive decorative suit pieces with randomized durability stats and amplifiers, the NPC will give you a full list and costs. When an epic update rolls out the coin type will change along with the suit available, you can exchange unused old coins for new ones at a rate of 3:1. Lvl 150: Veiled Island (Soldier Benen) Soldier of Miser? Lvl 150: Veiled Island (Soldier Benen) Got Sole? These short quest lines reward you with a small amount of Arena Points as well as fortune cubes and optional soul pet cards. Unfortunately I have not come across minimum level requirements for these quests. Lvl 50: Katan (Guard Captain Isla) Warn the Researchers! These roaming bosses used to be a great alternative to field farming with their fast respawn, now they need a little more time to pop back but they're still a more complex fight than other field mobs. They roll in packs of 5 and cast various debuffs including negative movement speed and poison. Like the Sanctuary quest line and Boss Ross these quests are only available to those within certain level ranges. A unique aspect of time attack quests is while they seem repeatable their timer is actually shorter as you progress through the set (unconfirmed for lower dungeons). One important information is missing: Do you have to kill mobs or do you have to collect quest items dropping from mobs. If you need quest items, the quest might take forever, because the drop rate is quite low for a lot of quests. These quests are not necessary to enter the Underground Dungeons but if youre going to be in there anyway you might as well do them, the initial quests from the Teleporter will also give you a little something just for talking to an NPC. All Underground Dungeon time attacks are repeated for each stage of the dungeon (1-4), so once you finished the 3rd time attack in stage 1 of a dungeon, you start over with the first time attack in stage 2 and so on. These are issued in order, killing the bosses in stage 2 will not complete a stage 1 quest. Like the Underground dailies these are just a nice little extra you should pick up since youre going in the dungeon anyway. We need more quests, there's nothing to do. Thank you for mentioning this as I only had a vague recollection of people wondering why they couldnt see the Undine daily quest, got the chance to roll through these on my Corruptor and have updated the reference guide with these requirements. "You need to complete the Silpineu to Miriel section to unlock the Undine daily quest"
Big blue glowing *floating* rock. Looks similar to the 3 you collect for the "strong legs" quest but floats a lot closer to the ground and I think it's smaller. The level of the monsters the quest brokers ask me to kill are between 10 and 15 levels below my character level. My character is level 48 and the monsters are level 33 to level 38. This means they are easy kills but I do not get much XP. In the past the monsters were between -2 and + 8 of character level. After level 46 there are now no more quests until level 50 (according to the Rappelz wiki). I am just doing the quest broker quests until I reach that level. They still give a good XP reward. Try doing the Daily Vulcanus quests. You can start these by talking to the Trade Director in any town. There are a few quests to do before you get to the dailies, but the daily quests themselves give a significant amount of exp. finaly got my char to 138 so started the 138+ questline now i came @the quest called finishing the jop where you need to kill 3cursed shadows, 3 zealot shadowshraper and 5x howling skelleton, Ive done the quest today in total 5x but there never apeard enaugh mobs even after running around for aproximaticly 10minutes all i got was 3/3zealot 3/3 cursed shadow and 3/5 skell.... is this a bug or am i doing anything teribly wrong? ty for respons. There isnt a bug with that quest as far as I know, there are several locations where the mobs will spawn but they sometimes take a minute or two to show up and it sounds like you've only managed to get one group to spawn? Some people have tried things like waiting for a second group to spawn before killing the first, retaking the quest a couple times to get the first spawn to multiply or teaming up with another quester. I have also seen it where people just simply werent passing over the spawn triggers which can be frustrating when you feel youve been running around for long enough. 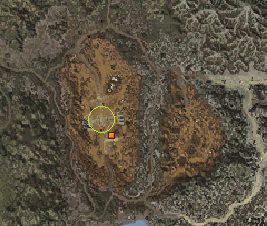 Stick within this area, the spawn in front of that one curved building usually isnt too hard to get. These spawn at roughly 3 points. One is west of the center, the other south east and the last is close to the NPC. People tend to forget the last since it is so far off.